When it comes to the kitchen, I like things to be quick and easy. All of the recipes I've written about take less than 20 minutes to prepare. So, this dish is right up my alley. 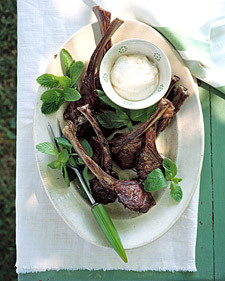 Tasty, reasonably healthy and speedy, Lamb with Yogurt-Mint Sauce is a new favorite in our house. I served it with a lemon mint tabbouleh and a side of steamed-then-sautéed onion, garlic and eggplant. For dessert: more non-fat Greek yogurt drizzled with honey, fresh sliced strawberries and a sprinkling of leftover chopped mint. Spoon over grilled or sautéed lamb chops.